Graham is the anchor presenter on BBC TV’s Ski Sunday and covers winter sports for BBC Grandstand and Eurosport. His natural charm and enthusiasm on screen have led to the BBC covering more in this area than they have ever done before. Last year, Graham competed in the return of BBC 1’s ‘Superstars’, where against some of the country’s top sportsmen, including current athletes he achieved an admirable first place amongst the veteran competitors and an overall fourth. Graham’s current passion is now competitive Triathlons, where he cycles, runs marathons and swims open water. An Olympic skier, Graham is one of the best skiers this country has ever known. He and his brother Martin dominated the skiing world until recently when they retired from competition. Since then, BBC Television were quick to snap Graham up and he has really come to love working in this medium. He has also become a regular reporter on ITV’s ‘Wish You Were Here’, reviewing lots of different types of holiday with his young family. He has been doing occasional spots for Sky’s Simply Shopping Channel in between. 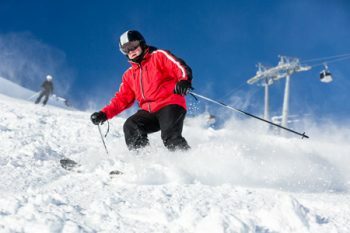 Graham holds the prestigious title of International Performance Director for The Ski and Snowboard Federation as well as the Patron of The British Ski Association. Graham is internationally admired and has done an enormous amount promoting skiing and winter sports, encouraging young people into this area. He is still very much involved with British teams coaching and motivating them. He is also on the Olympic committee. An experienced journalist too, Graham has written articles for The Daily Mail, Ski magazine and he has his own column in the Financial Times called Pink Snow. As one of this country´s only successful skiers, Graham has given motivational talks to companies such as Thomas Cooke and Paul Mitchell, where he used the psychology of sport to illustrate how one can overcome business problems. As a former team captain he is used to inspiring a winning attitude amongst audiences. Achieving goals even under the worse conditions is possible if you put your mind to it. .
Aside from a love of all sports Graham spends most of his spare time with his young family, enjoying music and films. Graham has travelled extensively and can truthfully say that he has skied at over 80% of the World´s ski resorts! Graham likes to cook and says he plays the guitar badly. Although maintaining close contacts with the sporting world, after developing his presenting skills Graham feels he could present a wider subject base. There is no doubt that he is a versatile television star in the making.